FORT BENNING, Ga., (Aug. 12, 2015) -- Heat is one of the highest risks any Soldier will face here on Fort Benning, said Jill Carlson, safety director for the Maneuver Center of Excellence. "You have to understand, here at Fort Benning, we have heat casualties in every month of the year," Carlson said. The frequency of heat casualties has to do with the experience of the population of the type of Soldiers on the installation, Carlson said, noting that Fort Benning is a training installation. "We've made great strides, really, and I really equate that to commanders and leaders engagement into it and the importance of it," Carlson said. 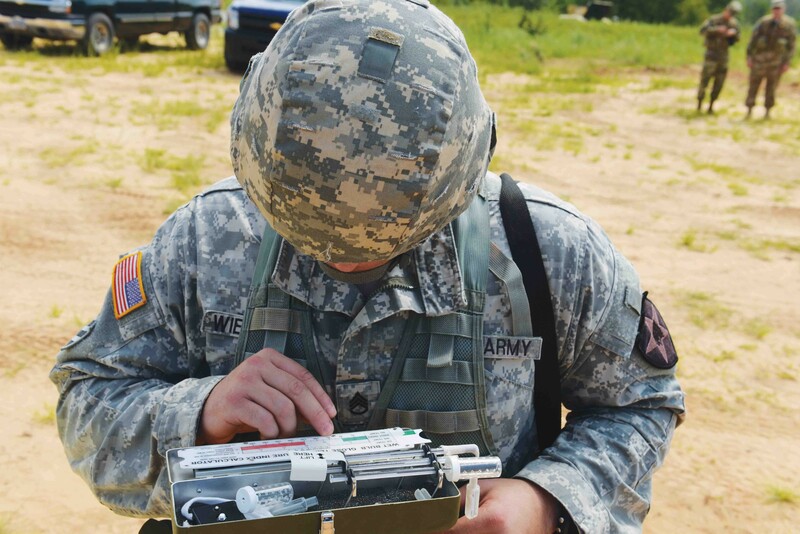 As part of U.S. Army Training and Doctrine Command protocol, units on Fort Benning go through training on how to prevent becoming a heat casualty. Commanders also have leeway to adjust training times, training uniforms and to reverse cycles in order to avoid heat casualties, Carlson said. At training sites, a wet bulb is read every hour by a trained Soldier. Within the wet bulb, there are three bulbs, which measure different things in the atmosphere: a wet bulb, or WG, a dry bulb, or DB, and a black bulb, or BB. Each bulb is read and all numbers coincide to provide a wet bulb globe temperature, or WBGT, reading. The reading is only used when temperatures reach 78 degrees and higher. When the temperature rises to 90 or higher, it is considered heat category five and cadre will typically start using extreme caution with their troops while working in the heat and doing physical training. When WBGT readings are in the fifth category, Soldiers are urged to drink at least one quart of water per hour while performing any work. The Fluid Replacement and Work/Rest Guide within the Heat Illness Prevention Guide advises work-to-rest ratios, as well as how many quarts of water per hour should be consumed when the WBGT is high. Additional mitigation factors include immersion coolers filled with ice and water, misting fans, ice sheets, field showers and Power Breezers and the battle buddy system, Carlson said. While Carlson said heat casualties do still occur on Fort Benning, the last heat-related death was actually from over consumption of water, or hypernatremia, while a Soldier was on a 12-mile foot march. Protocols on the installation are to evacuate at 101 degrees or higher. During the heat season, Carlson said between 500 and 600 heat casualties are reported, but only a small percentage are heat stroke or exhaustion. "I applaud the commanders for doing that, because that really is the right thing to do," Carlson said.